The complete chamber music programme is to be announced during summer 2018. Discover the secret rooms of eighteenth century Trondheim, one of the richests cities in Northern Europe at the time. 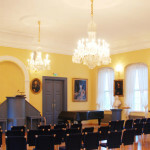 Barokkfest offers a splendid programme of chamber music performances in salons and private halls of Trondheim’s a number of eighteenth century palais. Barokkfest offers a range of chamber music concerts, presenting the gems of the baroque chamber music repertoire from Bach’s suites for solo instruments to the exhuberant italian baroque sonatas.